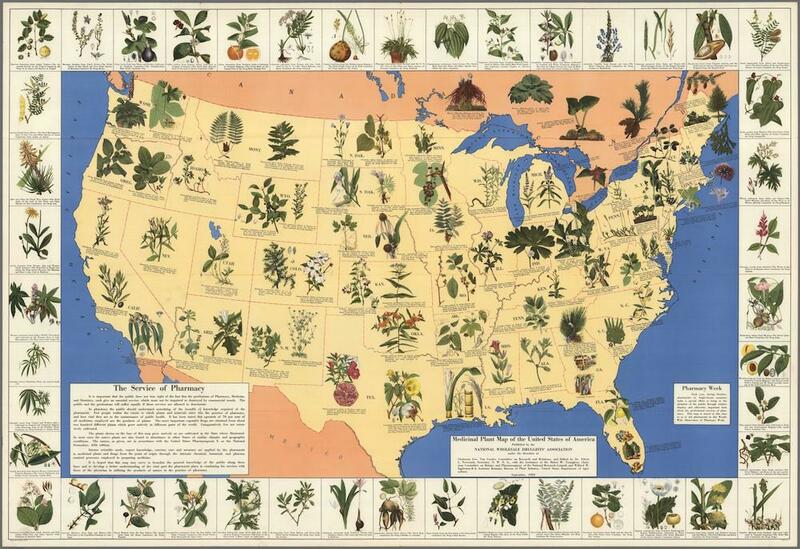 History of medicinal plants: Map of the plants in the United States from 1932. This map of medicinal plants depicts one or two important species that grew in each state in 1932, identifying the plant as native or cultivated and describing its medical uses. A few species of seaweeds float in the map’s Atlantic Ocean, and the border identifies important medicinal plants from around the world. As historians Arthur Daemmrich and Mary Ellen Bowden write, the early 1930s were a turning point in the pharmaceutical industry. In the previous decades, chemists working for large companies had begun to systematically invent new medicines for the first time, developing synthesized aspirin and vaccines for diseases like tetanus and diphtheria. The 1938 Food, Drug, & Cosmetic Act would bring a heightened level of federal regulation to the production of new medicines. And in the 1930s, 1940s, and 1950s, researchers would go on to invent a flood of new antibiotics, psychotropics, antihistamines, and vaccines, increasingly relying on synthetic chemistry to do so. The pharmacist’s direct relationship to the preparation of medicine would diminish accordingly. Click on the image below to reach a zoomable version, or visit the map’s page on the David Rumsey Map Collection website. “Medicinal Plant Map of the United States of America.” Edwin Newcomb and the National Wholesale Druggists’ Association, 1932.